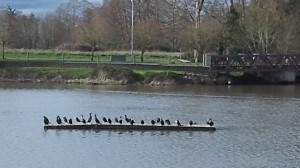 Waverly Lake ducks got all in a row: Maybe it’s a good sign. The weather wasn’t the only pleasant news today. I will get to the second pleasant item in a moment. But first, ever notice how a little sunshine brightens not just the scenery but your outlook as well? All the bad things are just as bad as they’ve been all along. The feds can’t get their act together to try to keep the country from going broke. The papers keep repeating how various programs and services are going to suffer, without ever asking the obvious question: “If you have to cut back spending by 2 percent or 5 percent, why not ask everybody in the program to take a 2 or 5 percent cut and keep the activity going?” If the programs are essential, wouldn’t that be more sensible than shutting things down?” But as I say, when the sun shines and it looks like spring is around the corner, one is inclined to let it go and not worry about it for a while. Now, the other pleasant news was from the city of Albany. The finance director, Stewart Taylor, announced he had refinanced about $30 million remaining from a $40 million bond issue sold in 2003 to build the water treatment plant near Scravel Hill. For some reason, the city calls this “refunding.” It’s not refunding. Nobody’s getting a refund. It’s refinancing.